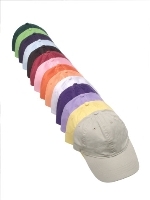 This is a classic brushed cotton 6-panel unconstructed low crown cap. It features an adjustable buckle self strap. If you like this cap, but want it in two-tone. See item #5333TT.